An Al Qaeda affiliated organization, namely Syria’s Al Nusrah, is being supported “overtly” by the US President, rather than “covertly” by the CIA. The support of Al Nusrah, an affiliate of al Qaeda in Iraq (AQI), is no longer channeled in secrecy as part of a CIA-MI6 covert operation, it is now being supported –in a semi-official fashion– as part of a US foreign policy agenda. The latter is also part of America’s diplomatic discourse, implemented in consultation with Britain, Canada, Germany and France. Although Al Nusrah was not mentioned explicitly, “support to the Syrian rebels” was the main topic of debate at the June 2013 G-8 meetings in Northern Ireland. While intelligence covert ops continue to perform an important role, Washington’s support to Al Qaeda in Syria is now “out in the open”, within the public domain. It is no longer part of a secret undertaking. It is part of the mainstay of US foreign policy, carried out under the helm of Secretary of State John Kerry. In a twisted logic, the bill purports to prevent “an extremist takeover” by supporting an Al Qaeda terrorist formation. The Senate Committee on Foreign Relations voted 15-3 in favor of the proposed bill. Ironically, the pro-Israeli lobby was also actively involved in lobbying in favor of aid to jihadist rebels. Israel has supported Al Nusrah militarily in areas adjacent to the occupied territories of the Golan Heights. Everybody knows that Al Qaeda is now directly supported by the US government. The implications are far-reaching. Obama’s decision not only undermines the legitimacy of the “Global War on Terrorism” (GWOT), it also casts doubt on the “blowback” thesis. Moreover, it begs the embarrassing question: Why is the US president supporting Al Nusrah, which is on the US State Department list of terrorist organizations? The sophisticated methods taught to the Mujahideen, and the thousands of tons of arms supplied to them by the US – and Britain – are now tormenting the West in the phenomenon known as `blowback’, whereby a policy strategy rebounds on its own devisers. (The Guardian, London, September 15, 2001). “What we’ve created blows back in our face.” The US government and the CIA are portrayed as the ill-fated victims. The CIA had been tricked by a deceitful Osama. It’s like “a son going against his father”. While the “blowback” thesis is an obvious fabrication, it has nonetheless served to provide legitimacy to the “Global War on Terrorism”. With “overt” support channeled by the US government to an Al Qaeda affiliated organization, the blowback thesis falls flat, it is no longer credible. The evidence amply confirms that the CIA never severed its ties to the “Islamic Militant Network”. Historically, US covert support to terrorists was a safely guarded secret, unknown to the broader public. Moreover, the CIA would never channel its support directly. It would proceed through its intelligence counterparts in Pakistan and Saudi Arabia. Since the end of the Cold War, these covert intelligence links have not only been maintained, they have become increasingly sophisticated. The broad political and media consensus in the wake of the 9/11 attacks was built around the blowback: Al Qaeda had attacked America. The Global War on Terrorism (GWOT) against Al Qaeda and its affiliates had been launched. Yet the evidence amply confirms that US intelligence continues to harbor several terrorist organizations which are on the US State Department’s list. Paradoxically, covert support to the terrorists by Western intelligence agencies (including the CIA, MI6, Germany’s BND) is an essential instrument of the “Global War on Terrorism”. Namely the war on terror to protect the Homeland is waged by using US-NATO sponsored terrorists and mercenaries as foot-soldiers of the Western military alliance. The support provided covertly to “jihadist” terrorist organizations in a large number of countries (e.g. former Yugoslavia, Afghanistan, Iraq, Somalia, Yemen, Libya, Syria, Niger, Mali, Algeria, Egypt, etc.) has been used by the US-NATO alliance to destabilize sovereign states. Al Qaeda was identified as the mastermind of the 911 attacks on the World Trade Center Trade Center and the Pentagon. Afghanistan in the wake of 9/11 was immediately identified as a “state sponsor of terrorism” leading to the bombing and invasion of Afghanistan by US and NATO forces on October 7, 2001. In turn, a gamut of counterterrorism legislation and executive orders were put in place in the immediate wake of the 9/11 attacks. Executive Order 13224, signed by President George W. Bush on September 23, 2001 “authorizes the seizure of assets of organizations or individuals designated by the Secretary of the Treasury to assist, sponsor, or provide material or financial support or who are otherwise associated with terrorists.” (Sept. 23, 2001). The US Congress passed the USA PATRIOT Act 2001, signed into law by President George W. Bush on October 26, 2001. The legislation was in response to the September 11, 2001 terrorist attack on the World Trade Centre and the Pentagon, which allegedly had been perpetrated by Al Qaeda. The Act pertains to the harboring and financing of terrorist organizations. Al Qaeda and its affiliates are defined in the PATRIOT Act as a terror network. Persons and organizations which support or abet Al Qaeda are considered as terrorists. The forbidden question: Does the substance of Executive order 13224 and the PATRIOT legislation quoted above apply to a US president, a Secretary of State, a Member of the US Congress? National governments which provide support to Al Qaeda are categorised as “State-sponsors of terrorism”. 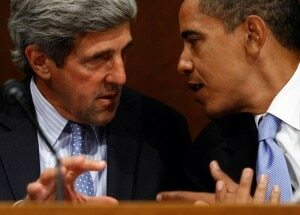 Barack Obama and John Kerry: Are They “Terror Suspects”? Now let us examine in more detail the Al Nusrah Front, which constitutes the main rebel fighting force in Syria. Al Nusrah is affiliated to Al Qaeda. The leader of Al Nusra, Abu Mohammad al-Golani, has pledged his allegiance to Al-Qaeda leader Ayman al-Zawahiri, who replaced Osama bin Laden after his death. According to the State Department Bureau of Counter-terrorism, Jabhat al Nusrah, the main rebel force in Syria is a terrorist organization, an affiliate of Al Qaeda in Iraq (AQI). The State Department has issued a “prohibition against knowingly providing, or attempting or conspiring to provide, material support or resources to, or engaging in transactions with, al-Nusrah Front, and the freezing of all property and interests in property of the organization that are in the United States, or come within the United States or the control of U.S. persons.” (emphasis added). It is understood that US State Department Counter-terrorism policy also applies to “state sponsors of terrorism”. Al Nusrah is financed by Turkey, Qatar, Saudi Arabia and Israel in close consultation with NATO and the Pentagon. The Obama administration has openly confirmed its support for the Syrian rebels with most of this aid channeled to Al Nusrah. The PATRIOT Act “prohibits knowingly harboring persons who have committed or are about to commit a variety of terrorist offenses”. Moreover, an entire gamut of executive orders as well as the 2001 Patriot legislation prohibit “the harboring of terrorists”. The Patriot Act imposed tough new penalties on those who commit and support terrorist operations, both at home and abroad.” The terror threat emanates both from “the terrorist who pays for a bomb as by the one who pushes the button”. According to the Patriot legislation, those “who pay for the bomb”, namely funding affiliates of Al Qaeda, constitutes a terrorist act. In other words, the Obama administration and its allies are harboring a terror organization which is on the US State department list. “The [PATRIOT] Act created a new offense that prohibits knowingly harboring persons who have committed or are about to commit a variety of terrorist offenses”, yet the Obama administration is openly supporting a terrorist entity, in violation of its own counter-terrorism legislation. According to CNN, quoting intelligence sources, Al Nusrah is “the best-equipped arm of the terror group” in Syria, with an estimated 10,000 forces. Where do they get their money and weapons? CNN does not provide any details as to Why Al Nusrah is the best equipped, in relation to the various so-called moderate rebels factions, which from a military standpoint are broadly inoperative. How many of these Al Nusrah forces remain operative following the government’s counteroffensive remains to be established. In relation to the latter, Turkish Police confirmed that the arrested Al Nusrah operative was in possession of sarin gas. The Obama administration announced last week that it will start arming rebels because Syria crossed a “red line” by using chemical weapons — including sarin gas — against the opposition. …Obama has not detailed the increased military support, but Washington officials told CNN that the plan includes providing small arms, ammunition and possibly anti-tank weapons to the rebels. The blowback thesis is now defunct. The US has never ceased to support Al Qaeda. 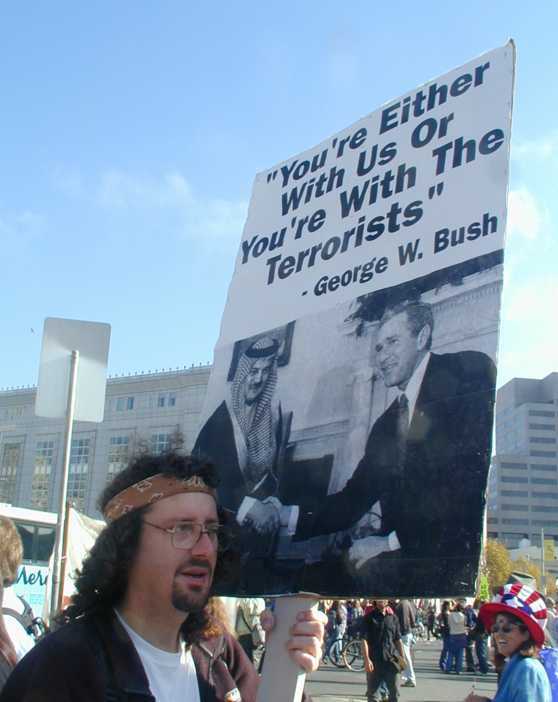 These terrorist organizations were created by US intelligence and supported by Washington. The blowback thesis is refuted not only by Obama’s “overt support” of Al Nusrah but also with regard to the Libyan Islamic Fighting Group (LIFG), an Al Qaeda affiliate, which was directly supported by NATO from the outset of the insurgency and Libya bombing campaign in 2011. The “Global War on Terrorism” (GWOT) has become an increasingly fragile concept. Waging a “War on Terrorism” with the active participation of an Al Qaeda affiliated organization constitutes an obvious fallacy, a big lie, a non sequitur. The propaganda and media disinformation campaign behind the “Global War on Terrorism” has also entered a dead alley. Going after the terrorists by supporting the terrorists? Will the American public support a government which funnels billions of tax dollars to a terrorist organization as a means to “combating terrorism”? The Pentagon’s post-911 military doctrine is predicated on the “Global War on Terrorism”. It is a consensus within US military. It is used in the recruitment, training and indoctrination of US forces. Will American servicemen and women accept to swallow the big lie and fight in what visibly constitutes a fake “war on terrorism”. President Obama’s “overt” support to Syria’s Al Qaeda rebels “opens up a can of worms”. How are we to categorize an American President who says he is committed to fighting Al Qaeda, while at the same time supporting Al Qaeda? The entire Homeland Security doctrine tumbles like a deck of cards. The US government is in blatant violation of its own counter-terrorism legislation. This video link (tweeted by Clare Daly) contains a colleague’s rebuttal. This entry was posted in Military, Obama and Company, Region: Africa, War and Peace and tagged cia al qaeda, g8, obama drones, obama funds terrorists, patriot act, syria. Bookmark the permalink. We applaud you, Sistah ~ and urge you to take care and duck. Politicians in the US who stand up to the machine tend to get on planes that crash. Even our news journalists who expose too much have sudden car wrecks. Our prayers go with you… and thank you for your courage. Thanks a million for getting in touch. We have had huge feedback, mostly positive, with a small number of people giving out hell. I think the whole portrayal of the visit by the media was just an attempt to cover up the real issues and record of the G8. I was glad to be able to rebalance the record a little and heartened that so many people agree. Your title is aptly chosen! This story has completely evaporated into what the Kardashian’s are wearing; only to be overtaken by Paula Dean’s muttering’s on the Food Industry’s network. Remember the shootout at the Benghazi hangout, erroneously called a U.S. consulate. It was a meeting place to coordinate aid and launch rebel-led insurgencies against unfavorable governments within the Middle East. Before Christopher Stevens was killed, he was running guns for the CIA, who in turn funneled those weapons to al-Qaeda terrorists, used as proxy warriors and provocateurs bound for Syria. Yes, that same motley crew from the caves of Afghanistan that was fingered for ‘allegedly’ taking down the twin-towers and building-7, for which Ben Laden was repetitively murdered, resurrected and without witnesses finally buried at sea; the same al-Qaeda characters for which the US invading brutes have given hot pursuit with a relentless scorched earth policy which has mushroomed out as the global war on terror. This being the case, shouldn’t both Stevens, posthumously, and the CIA be brought up on charges of aiding and abetting the enemy!? John F. Kennedy was right about needing to scatter its carcass to the four corners. Yes! They should all gaze into the mirror. The terrorists they hunt will be found therein, gazing right back. “According to the 2001 Patriot Act, those “who pay for the bomb,” namely those who fund affiliates of Al Qaeda, are terrorists. In the words of George W. Bush on September 11, 2001, “We will make no distinction between the terrorists who committed these acts and those who harbor them.” Another glaring example of the hypocrisy and double standards of the USA and its allies. yep, michel quoted both, too. thx for the reblog. and truman’s lament is not credible… I mean, he may have said it, but i don’t believe he was that stupid. They wanted a gestapo and that’s what they got. If you haven’t already, you should read: Blowback – 1988 – by Christopher Simpson. Much of the early building blocks forming the emerging National Security State, began with the importation of Nazi war criminals; via Operation Paperclip, folding this element into its ranks, according to Simpson, was done behind Truman’s back, and against his explicit orders. Already, the presidency was slowly becoming an unimportant, insignificant fixture within this growing rogue super-cell; kept intact only as a feel good façade to placate the public mind into thinking everything was fine and dandy within this, so called, democracy. It was Allen Dulles, Frank Wisner and John J. McCloy, to name a few, who co-opted the friendship of these criminal – birds of a feather. Many of which, through Vatican ratlines and OSS/CIA cover, were scurried off to the safety of South America. Nazi war criminal, Hitler’s right hand, Reinhard Gehlen was responsible for a brutal torture interrogation program of Soviet prisoners of war that resulted in the murder of three to four million Soviet prisoners, yet his record was secretly expunged of any atrocities so as to utilize his existing Nazi networks, all the while his methods becoming a mentor and father of the early CIA. When JFK came into office, his intent was to bust up this cabal of secrecy. We all know the outcome of those efforts. From that day forward; the events of Dealey Plaza left the residents of Earth to breathe a heavy laden toxic atmosphere of lies and deceit, which only continues to multiply exponentially in weight and toxicity with the passage of time. In 1948 Dulles and Wisner officially created Operation MOCKINGBIRD by raising Reich’s minister of Propaganda and Public Enlightenment, Paul Josef Goebbels’ Nazi mass media propaganda machine in America. It was an illegal domestic operation designed to mimic (MOCK) the propaganda machinery Goebbels’ had so masterfully crafted for the Third Reich. Wisner who ran Mockingbird in its earliest days once boasted that the operation was like a mighty Wurlitzer … I can play any tune I want on it and America will follow along.